We love the rain, but it’s not a great friend to our build! 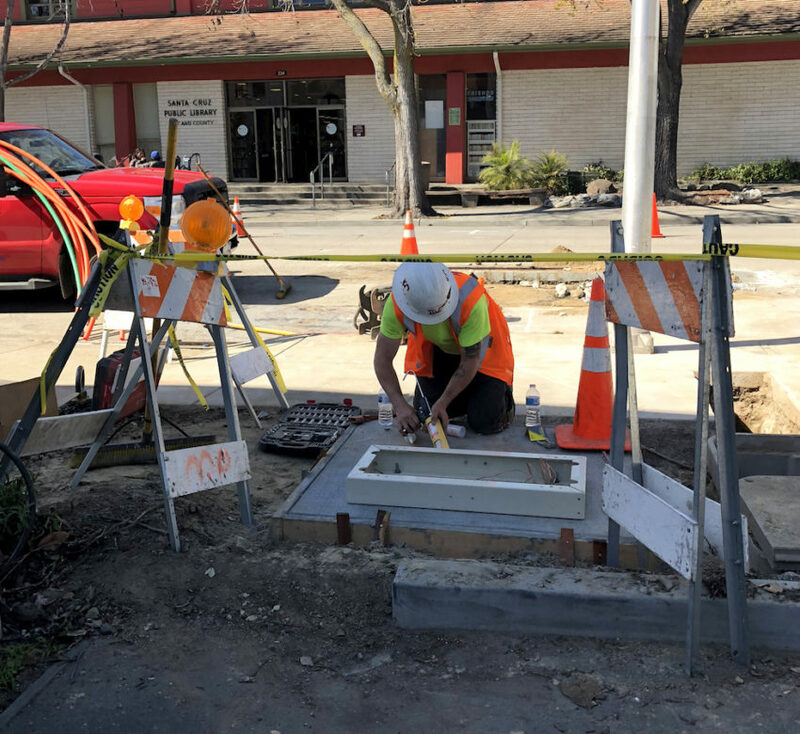 If you’re following our construction - and if you live or work downtown you’re sort of forced to (sorry) - you’ll notice a lull during rainy weather. Pro tip: the weather app on your phone, is also a great construction forecaster. While we would never wish against the rain, it appears most of the rain for this season has passed and we’re happy to see our build moving full speed ahead. Among all the exciting things happening, we got our cabinet! It’s not just any cabinet, certainly not a random junk cabinet, but a cabinet which will be the distribution hub for the neighborhood. 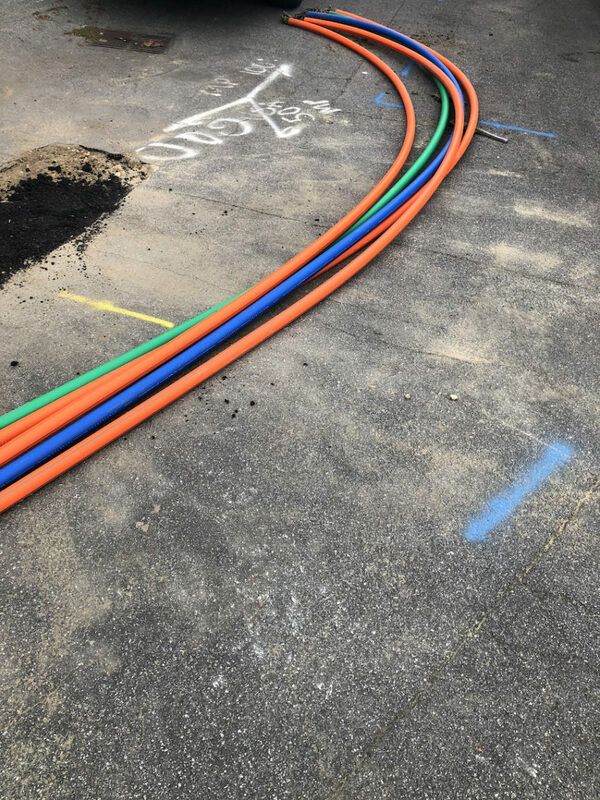 Our fiber back-bone connects to our building, and the conduit (the Fiber!) feeds from our building to the cabinet. 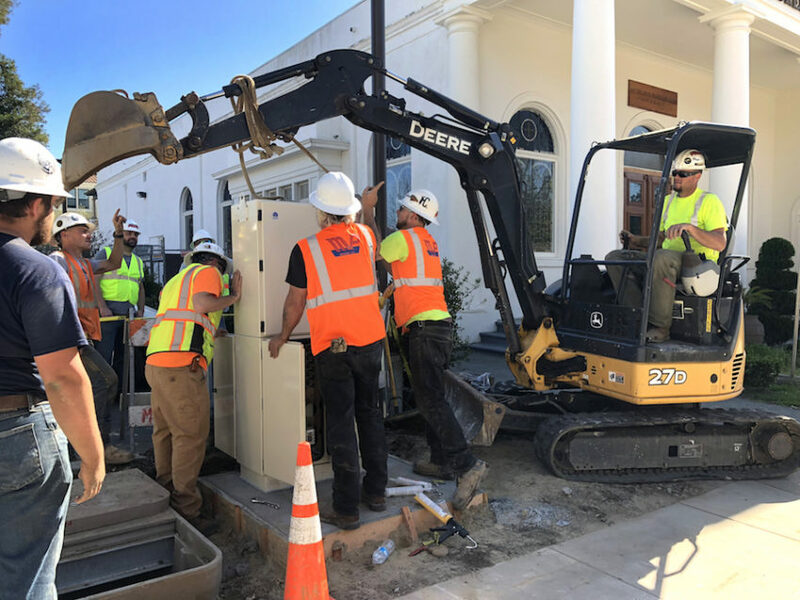 The cabinet is where separate fiber lines are split to go to your street and then directly to you bringing fiber-fast speeds to your home or business. 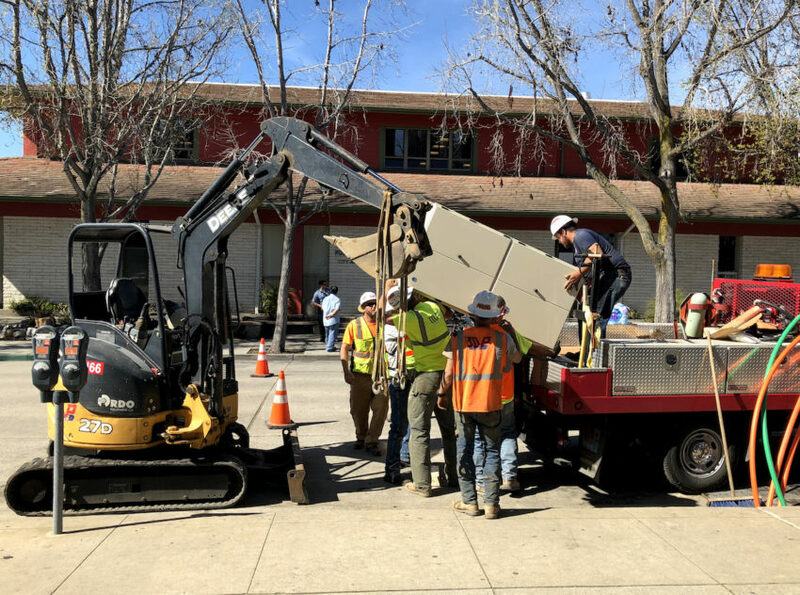 Each cabinet we install has the capacity to serve 1,000Mbps to 1,000 residents! That’s a lot of fiber! As you can see, moving a 350 pound cabinet is no easy work. 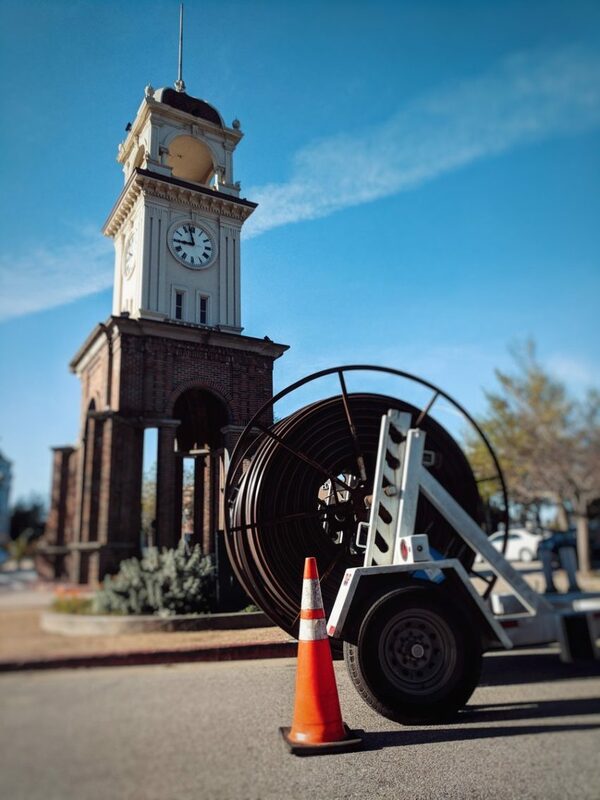 While we must take a moment to apologize to the library for all the noise, we’re also excited at the thought of such important, community-central locations in our city getting the quality internet connection they need to better serve all of us. 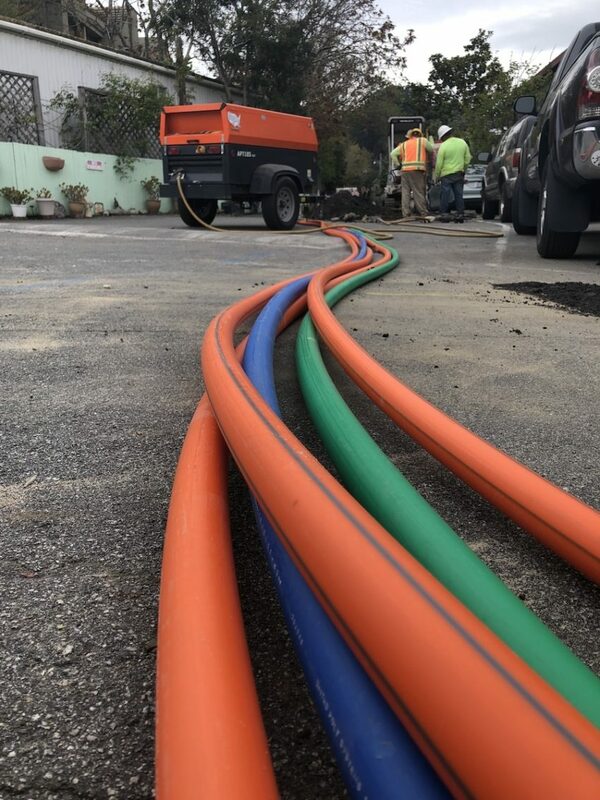 We’ve really enjoyed getting to talk to community members about the fiber project, and about internet in Santa Cruz generally. Our construction over the past week in El Rio has offered us so much insight into exactly this. You may have seen us out canvassing, and while we want you to sign up for service, we also do this to talk to potential customers one-on-one. We had some very fair complaints about the noise. We also heard from those excitedly anticipating the new service. One man was eager to show us his plans for installation, from where he wants us to dig outside his house to where he plans to put his router inside. We had another future customer who can’t wait to get away from a corporate ISP where they get LESS than 1Mbps download speeds. Long story short, we’re excited to see better infrastructure in a part of town that really needs it! Most importantly, we’re close completing construction! Our latest projection is that we will be hooking up customers by mid-May, just a month down the road! We want to take this opportunity to remind everyone that time is running out for our Downtown Promo. And it’s not just the price that’s unheard of (50 bucks for 1000Mbps!) it’s also the free installation which can be quite expensive outside of this construction project. Make sure we build to you when it’s still free and sign up at SantaCruzFiber.com/Downtown. Locked into a contract with one of the big guys? Give us a call to see if there’s something we can do for you in the interim. Stay tuned for more updates, especially as we wrap up construction and begin installing people!